Jubilee Nomination at Bomas of Kenya turn chaotic following disputed nominees list submition. - Bana Kenya News, Real African Network Tubanane. 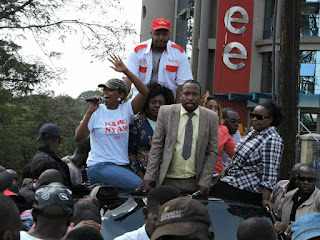 Home Nairobi Jubilee Nomination at Bomas of Kenya turn chaotic following disputed nominees list submition. Jubilee Nomination at Bomas of Kenya turn chaotic following disputed nominees list submition. Chaos broke up at the Bomas of Kenya following discrepancy from the supporters regarding the Names presented in the ballots. It is known that the list that was brought was different from the list the Members of Jubilee had. The chaos broke up at the Bomas of Kenya as unknown person who is not an aspirant tried to control the group. The individual had a supporting group. According to the sources, the group which clashed with the Jubilee officials in the Bomas of Kenya was sponsored a well known City Politicians Maina Kamanda and Mike Sonko. The Jubilee secretary general Raphael Tuju condemned the chaos as it depicted a bad picture in the party. Speaking at the Jubilee plaza, the SG claimed that the chaos was financed by a person who they have details. The Nomination list presentation did not happen as expected and the Jubilee official said the process will be repeated. The chaos in the Nominations processes are continuously in the chaos following similar undertaking went down in Naivasha on Tuesday. The Party is looking forward to having peaceful nominations across the country.